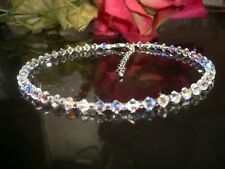 Swarovski Crystals AB Aurora Borealis Ankle Anklet 10". Spectacular Anklet bracelet crafted with real Swarovski bicones beads of 4mm (not fake imitation) on crystal clear AB, the crystals has a sparkly of the aurora borealis create an infinity of soft combination colorsblues, purples,pinks,yellow. 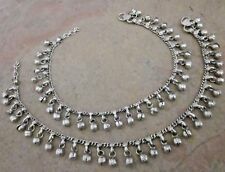 One pair with tiny circle & hanging bells gives traditional Indian look. Another ethnic cross chain anklet pair with bells. 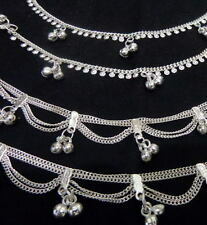 These are beautiful handmade two anklet pair made by Indian artisan. Quantity ~ 2pcs / 1 Pair As Shown. Anklet is 10" ~ Made to fit most. 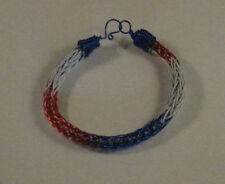 I am not a professional photographer and did the best that I could to show you the quality and colors of the anklet. 6 mm Crystal AB Celestial Crystal Bicones. Stretch Magic Elastic Jewelry Cord. These ghungroo bells produce a louder, clearer, higher and sharper pitched sound than our silver tone belly chains. Ghungroo Bells Anklet. If fit and worn properly, you should barely notice it's there except for the tinkling of bells as you walk. Swarovski Crystals AB Aurora Borealis Ankle Anklet 9.5". Spectacular Anklet bracelet crafted with real Swarovski bicones beads of 4mm (not fake imitation) on crystal clear AB, the crystals has a sparkly of the aurora borealis create an infinity of soft combination colorsblues, purples,pinks,yellow. Swarovski Crystals AB Aurora Borealis Ankle Anklet 11.5". Spectacular Anklet bracelet crafted with real Swarovski bicones beads of 4mm (not fake imitation) on crystal clear AB, the crystals has a sparkly of the aurora borealis create an infinity of soft combination colorsblues, purples,pinks,yellow. Quantity ~ 2 pcs / 1 pair. 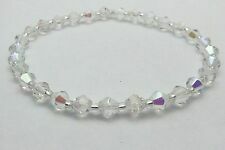 Swarovski Crystals AB Aurora Borealis Ankle Anklet 9". Spectacular Anklet bracelet crafted with real Swarovski bicones beads of 4mm (not fake imitation) on crystal clear AB, the crystals has a sparkly of the aurora borealis create an infinity of soft combination colorsblues, purples,pinks,yellow. 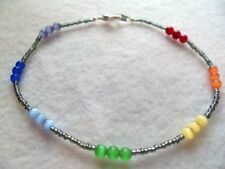 Handmade Beachy Beaded Anklet. Made with Green iridescent toho beads, silver stainless steel spacers, white jade beads and silver plate dangling flip flop. Lobster clasp. Very pretty delicate look. Celestial Crystal Oval Stretch Ankle Bracelet - Crystal AB. 6 x 9 mm Celestial Crystal Oval Faceted Glass Beads. Clear Glass Seed Beads. Elastic Cord. I am not a professional photographer and did the best that I could to show you the quality and colors of the item. Anklet Bracelet Men Ankle Bracelet Women Evil Eye Bracelet Evil Eye Anklet . Condition is New with tags. Shipped with Standard Shipping. Handmade evil eye ankle bracelet with a square glass blue evil eye 8mm It has closure with a macrame knitting on both sides so you can wear it in 2 ways and ends with two blue beads. It is adjuastable and is suitable for men and woman and kids. Love it OR your Money Back! No Hassle! Beaded Anklet. A beautiful beaded Anklet. Bring a part of the beach with you wherever you go. But item should be in new, unused condition. Multi Color Swarovski Elements and White Pearls Anklet Bracelet - 9 1/2"
HANDMADE MULTI COLOR SWAROVSKI. 4 mm Glass White Pearls. 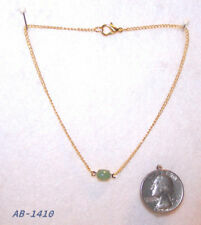 BRACELET 9 1/2". Clear Silver Lined Spacer Beads. I am not a professional photographer and did the best that I could to show you the quality and colors of the item. Bridal Stretch Anklet Ankle Bracelet. 6 mm White Glossy Smooth Glass Pearl Beads. Elastic Cord. I am not a professional photographer and did the best that I could to show you the quality and colors of the item. 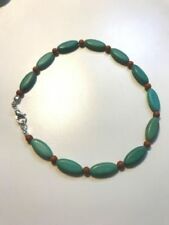 This anklet is made of a natural colored hemp cord. Small clear and red colored acrylic beads with larger glass and acrylic beads in red and black. So Pretty! 9-10", with 1" chain extender. The anklet is made with alpaca silver which is an alloy of zinc, iron, nickel and copper. The anklet was handmade in Peru. 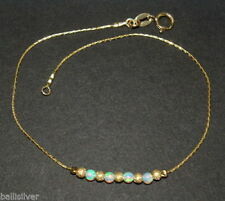 Gold Stardust Bracelet or Ankle Bracelet (2961) Plus Sizes too! Red seed bead ankle bracelet, 10.5"
This is a cute little red ankle bracelet, approx.